St. Paul’s is a thriving, vibrant community. We offer many different ministries. We invite you to become part of our church family and join us in our commitment to serving the Lord. This is the ministry of our faith and the opportunities that we have to come together to worship and honor God. Our Sunday morning Worship Service at 8:00 is a Spoken Liturgy Service. 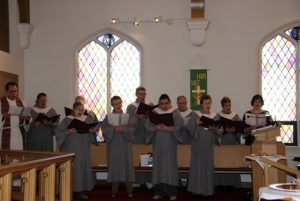 Our 10:30 Service is with music and our own St. Paul’s Choir under the guidance of our musical director, Missy Cheyney. Holy Communion is served at both services. During the summer, we have one service at 9:00 AM with Music and Holy Communion. We celebrate a Family Sunday on the first Sunday of each month. 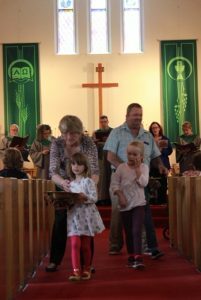 Families worship together and our children have an active role in the service. Through our Eucharistic Ministry, we bring Holy Communion to our homebound members. St. Paul’s Spiritual Growth Ministry provides opportunities to strengthen and create a clearer understanding of the Word of the Lord and the direction it provides in our lives. The Recovery Bible Study is held on Thursday from 10:00-11:30 AM. This Bible Study follows the 12-Steps. This is our most important ministry. Our Sunday School meets during the 10:30 service on all Sundays other than the first Sunday of the month. Children in grades 3 through 5 can attend Sunday School. Children begin each Sunday in the Church with their families. After the children’s Message with Pastor and his friend Marvin, the children leave with their dedicated teachers to learn the Word of God through lessons, activities and songs. Jr / Sr High Youth Group: Our youth get together for outreach, fellowship and service projects centered around serving the Lord and giving back to the community. At our Vacation Bible Camp Week in the summer, kids come together during the last week in June for four evenings to enjoy music, games, activities and food while learning God’s Word. At St. Paul’s we understand that at any time in our lives, we may need support to get us through a challenging time. Through our caring ministries, we have many ways to help. We provide comfort food through our Manna Meals program, delivering meals during a temporary circumstance such as illness, surgery, or a death in the family. Anyone can request prayers on our Prayer Chain which will begin the process of having our members include the need in daily prayers. Following funerals or other events, our Martha Ministriesteam provides light meals or refreshments at church. St. Paul’s Food Pantry is well stocked and available to provide food to members and surrounding communities in need. 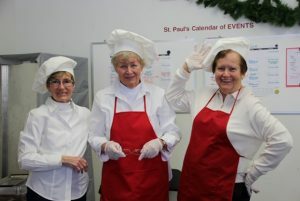 St. Paul’s provides many different ways to come together as members of a church family and enjoy the camaraderie and fellowship of each other. Every week after Worship, our Sunday Morning Coffee Hour in Fellowship Hall gives weekly time for socializing. 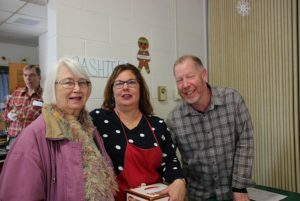 The Thursday Morning Group helps with many tasks around the church and spends countless hours creating craft items for St. Paul’s Church Fair. Our Men’s Breakfast Group meets once a month for breakfast at Denny’s in Wethersfield from 7:30-8:30. Church Chapters is St. Paul’s Book Club that meets six times during the year to discuss a variety of genres in books. Our Adult Fellowship Group meets four times a year to enjoy each other’s company while participating in wide-ranging activities. We look to spreading the good news of God in Jesus Christ to our neighbors and the community at large through different opportunities. Zachary’s Table is the inspiration of our member, ten-year-old Zach, who wanted to provide a hot meal to anyone who needed one and wanted it to be completely free for all who came. Supplied through donations of our members, local food stores, area companies and guests, we serve a totally free community meal on the third Tuesday of each month. Through monies raised at our annual Church Fair, we support organizations that help others. 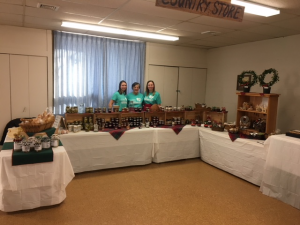 Funds raised at the fair come from specialty areas that include hand-crafted items, Gramma’s Attic, Baked Goods and our Kitchen Cafe including homemade soup! Proceeds from the 2015 fair were donated to St. Paul’s Ministries and the ELCA Good Gifts Program. Funds were used to purchase animals and trees to enable others to become self-sufficient in their everyday living. Join us at different activities and opportunities that come from the belief that all things come from God and are to return to God. In our offertory prayer we often say we offer with joy and thanksgiving what you have first given us—ourselves, our time, and our possessions, signs of your gracious love. These opportunities help us to make stewardship a way of life. 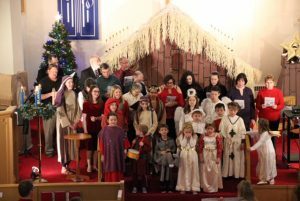 Our annual pledge campaign makes it possible for us to carry on the work of God through our talents and treasures.